NOTICE: This page is no longer being actively maintained here. Please refer to http://wiki.minnowboard.org/MinnowBoard_MAX for the latest information. NEWS: Interested in Google Summer of Code with MinnowBoard.org? 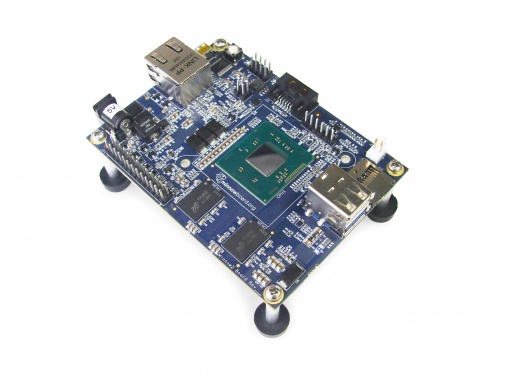 Please visit our MinnowBoard GSoC2015 Page! Note: These features may be subject to change without notice. Hardware design files will be made available shortly after the board enters final production. Current estimate of public availability is June 2014. 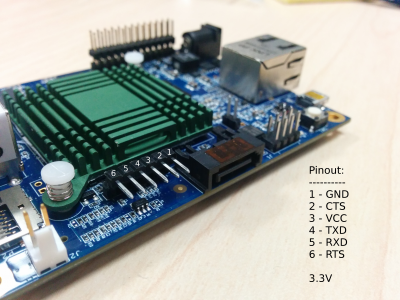 The Minnowboard Max uses a 5.5 x 2.1mm barrel 5V power plug (+/- .25V or 4.75 - 5.25V), Recommended minimum 2.5A power supply. It is a Center Positive power supply, indicating that the center (tip) of the output plug is positive (+), the outer barrel is negative (-). NOTE: If you try to power both a MinnowBoard MAX AND a hard drive (spinning or SSD) off of the same power supply, please use a minimum of 3A supply, preferably 4A. Failure to do so will likely result in odd behavior of the MAX as the whole system may be pushed into a brown-out situation. The serial console port (UART0) uses a 3.3v FTDI serial cable with a 6-pin connector. This is a reasonably common cable, also used on the Arduino Pro, Arduino Pro Mini and Arduino Lilypad. NOTE: CTS,VCC, and RTS are not used on the debug UART header. The pinouts and connections are listed to facilitate locating and connecting a compatible adapter. NOTE: The serial pinout is flipped between A0 and A1. A0 boards are rare, and are only being documented for completeness. The RED wire is power and is internally not connected on the MinnowBoard MAX. This is the On/Off status indicator. When lit the system is running. While the MAX (from a hardware perspective) supports HDMI CEC, the signal is, unfortunately, not passed completely from the micro-hdmi connector to the CPU. This means we lack the ability to directly manipulate CEC from the A1 and A2 revisions of the hardware. It has been proposed that this be resolved in a later revision of the board, but it is unknown at which point (if it ever is) rectified. The MinnowMax uses a Realtek RTL8111GS-CG PCIe based chipset to provide 10/100/1000 ethernet connection. Results of some performance tests using iperf are available HERE. The low speed connector uses 0.1" (2.54 mm) Male header pins in a 2 x 13 array, for a total of 26 pins. Pin 1 is the in the row closest to the power connector, and closest to the board edge. NOTE: Pins 5-26 are shown above with their PRIMARY configuration, any pin may be switched to being a generic GPIO as well. This would give a total of 22 GPIOs, with two of those being PWM capable. Denotes Pins that have been tested and work as expected. Remember to drive the pin to ground. The High speed connector uses a TE Connectivity compatible 60-pin header. The generally recommended header is the 3-5177986-2, or the 60POS .8MM FH 8H GOLD part that rises 7.85mm, allowing for 3/8" standoffs at the corners to be used to attach the lure to the minnowboard. 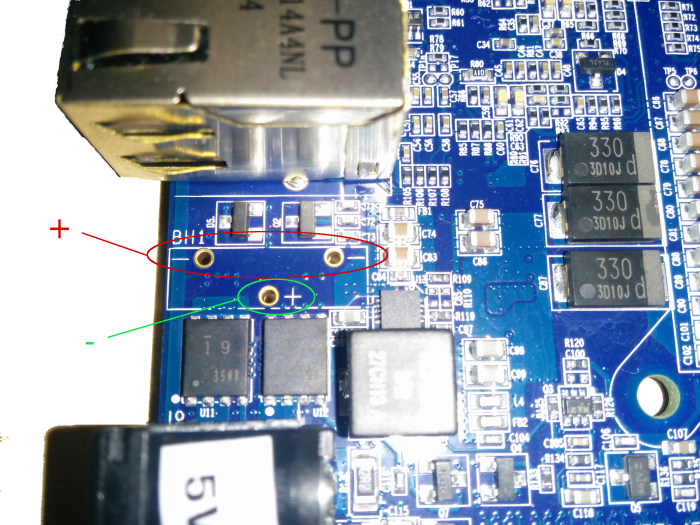 This is a pinned out port to allow for external flashing of the boot spi. Dediprog and Flyswatter devices have been tested and verified to work with this. This is a 5V 2-pin pin out originally intended to be used for a CPU fan. The single core (E3815) and the dual core (E3825) however use passive heat sinks, and thus do not, under normal circumstances, need a fan. It is theoretically possible to pull upwards of 1A through this port, however you should refer to the released schematics to verify that number before attempting to use this for anything. The pins have a 2.54mm pitch. These Screw Terminals 2.54mm Pitch are an example of a compatible component. NOTE: If you are using an A0 board, the pinout is reversed. Always verify pin output, preferably with a multimeter, before using J2. This pin is intended to allow for power toggling via a remote switch or relay. It is fundamentally no different than pressing SW1, and behaves identically. NOTE: This is not populated, by default. J6 header is allows for an external LED to be connected to the SATA interface's activity signal. when a LED is connected to this header it will blink based on the amount of SATA read/write activity. This is a jumper point, mostly available for debugging, that enables the sd card write protect explictily. This is not populated on production boards. This is mostly for firmware development, but there is a specific GPIO set, at manufacture time, that determines 1GB or 2GB(or more) memory sizes. GPIO_S5_5 is the GPIO that will determine the memory configuration. in order for Linux to boot and program the I2C EEPROM. If you require a monitor to work, but it's not there is a work around that seems to resolve the issue for most folks. Specifically placing a POWERED HDMI switch between the MinnowBoard MAX and the display offsets the missing level shifter, as most powered HDMI switches do their own level shifting. Some of the pins on the LSE and HSE, specifically those when switched into GPIO mode, can alter the way the CPU attempts to boot. In some cases the changes can prevent the system from successfully booting. When using these pins, particularly on Lures, please be aware of the limitations. 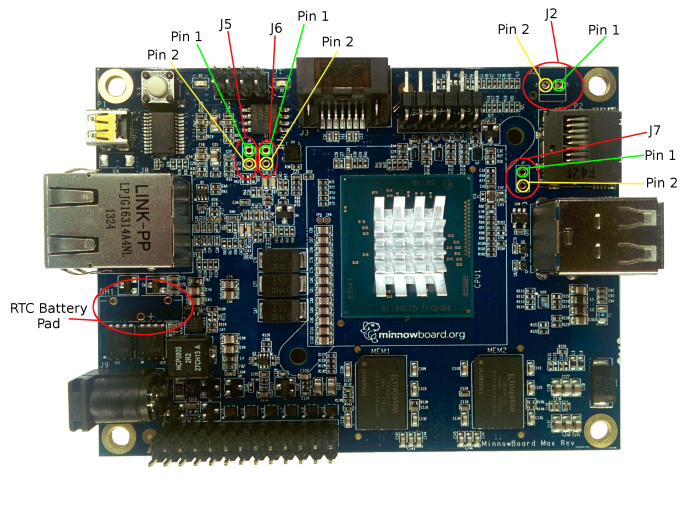 Pin 26 was always intended to provide a good MCLK (Master Clock) for I2S functionality, however the pin that was chosen originally does not actually meet the needs originally intended. In a later revision of the board (A4 onwards) this signal will be replaced with a signal that will provide a good MCLK. This is a notice that if you make use of the pin, software and hardware may need to be updated once the A4, or later, designs are available. There is currently no ETA for the A4 boards, and this is being mentioned just so people are aware of the impending change. There is a manufacturing issue that has occurred on some boards manufactured in early 2015, specifically a metal plate was being left covering the High Speed Expansion Headers (HSE). The general recommendation is to remove that plate, it is not expected to cause damage in the normal case. See the bug list, linked above. There is an issue with regards to some monitors not being able to display from the MinnowBoard MAX. Most monitors seem to be fine, but some will either completely not show a display (even at firmware boot-up) or may only show a display after the operating system is booting. This turns out to be an issue with regards to HDMI vs. DVI detection and initialization. A work around is being added into the firmware to resolve this. There have been some additional reports that some monitors may still not be working in the FIRMWARE, but are working once the OS (Linux) comes up. This is likely related to the above issue concerning weak HDMI signals, please refer to that if you are continuing to have problems. The RTC may not function correctly (when a battery is added) because resistor R278 (back side of the board) may be missing. Adding a 1K or 2K resistorshould resolve this. There is a potential issue when using a powered USB Hub. 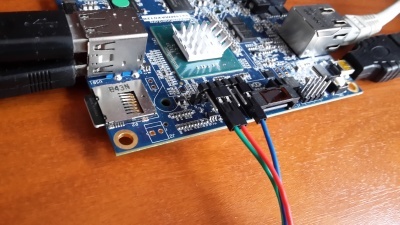 If the hub, erroneously, provides power over the USB 3 or USB 2 input connector, the MinnowBoard MAX will use that as power. This is in violation of the USB spec, and will be rectified in a later revision of the MinnowBoard MAX. It is suggested that you check powered USB hubs to confirm that they do not provide power back to the board, as described, and if a hub is found to do this, please report it here. A hub found to be doing this should be used without being externally powered if used at all. NOTE: This is not an indication that hubs do not work, or that USB does not work. This is merely an indication that some powered hubs violate the USB spec, and there is a flaw (a diode that should be added) in the MAX design. USB Hubs work fine. Another issue might appear if a wireless USB dongle operating at 2.4 GHz (e.g., a wireless receiver for input devices) is connected to the USB2.0 port together with an USB3.0 device attached to the USB3.0 host connector. In this case the device connected to the USB dongle can become unresponsive. A solution is to connect the dongle to the USB2.0 port using an extension cable or a USB hub. This page was last edited on 10 April 2016, at 20:30.